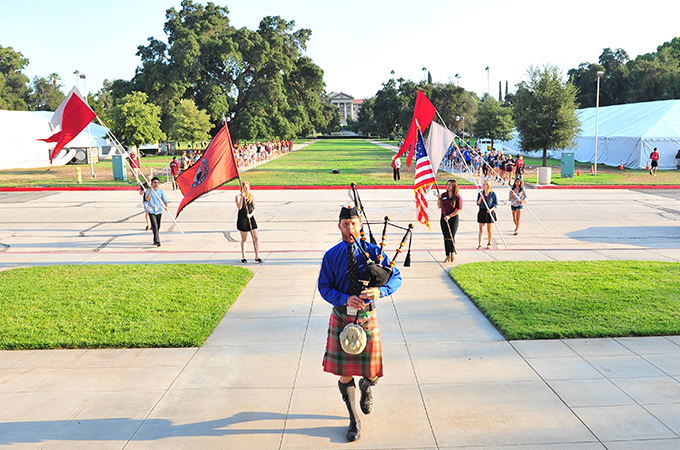 A bagpiper leads new students into Memorial Chapel for the Convocation ceremony. 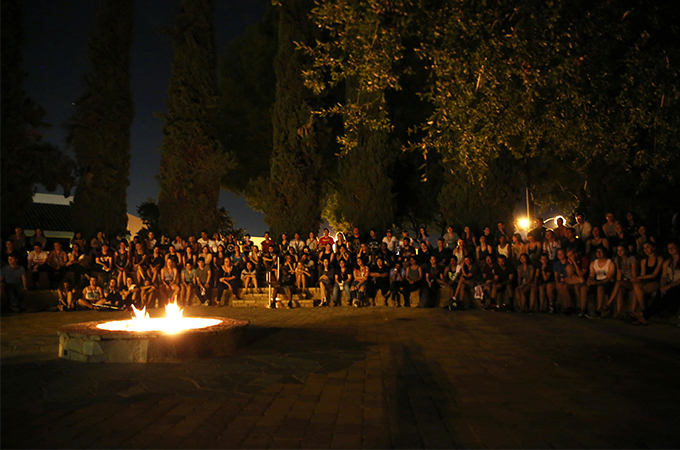 New students gather at the Fire Ring to listen to U of R ghost stories. Dawit Aklilu ’20 opened with a story about the haunting of Prospect Park, followed by Meg Leach ’18, who told a tale about an insane asylum that, she insisted, today results in a strange phenomenon involving cars, baby powder, and handprints. Emily Grosskopf ’20 set the scene of a lonely ghost named Andy who dwells in the basement of Anderson Hall. Cristina Gomez ’20 talked about her ghostly experiences while living in Merriam Hall and shared an account of hauntings in the Fine Arts Building. “It’s a well-known fact among music students that it’s a bad idea to be there after a certain time at night,” she said. Throughout the evening, upperclassmen egged the storytellers on with exclamations of “It’s true!” and first-year students showed their appreciation with gasps, screams, and bursts of applause. Ghost Stories concluded with a walk over to the Hall of Letters for a game of Sardines, in which I did not partake—I know better than to go in there at night. Other not-so-spooky New Student Orientation Week activities included Pajama Jammy Jam, a pajama dance party, and Playfair, an interactive program that allowed new students to meet one another and begin forming friendships. 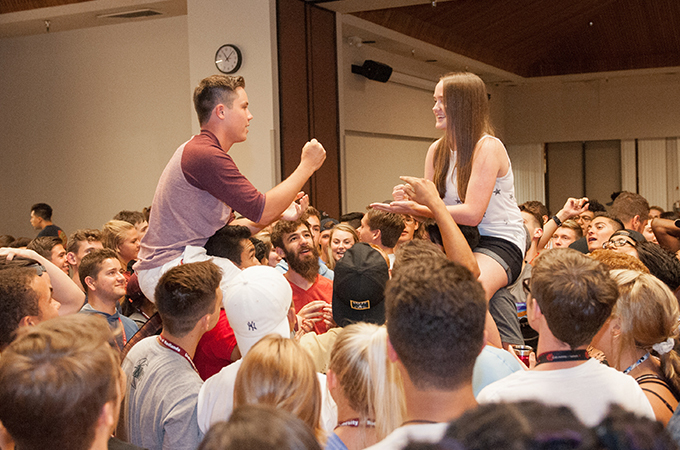 A giant game of rock-paper-scissors and other icebreakers are highlights of Playfair in the Orton Center. Och Tamale Comedy Hour introduced new students to the services available to them on campus and featured the “PSafe Song” sung to the tune of “We Will Rock You,” a gameshow skit about finding love while avoiding STIs, and other skits about substance use and consent. There was also a guest appearance from Thurber. 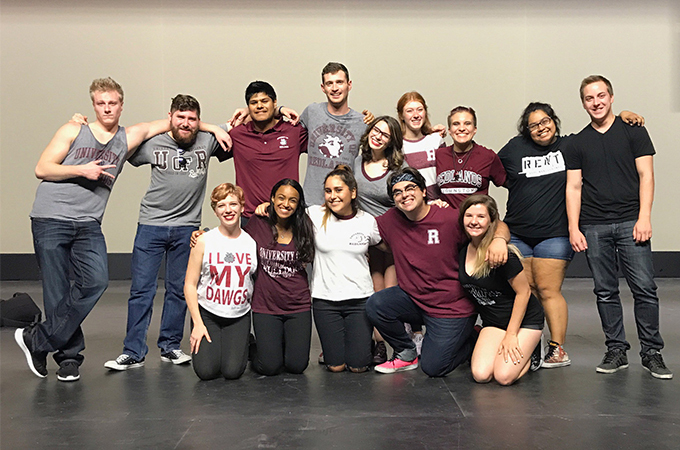 Och Tamale Comedy Hour, directed by Noah Sylvester '18, features Bulldog talent to entertain and educate. I haven’t walked past the Fairmont Rock recently, but I heard that the Johnston students may have staged a glitter and spray paint attack, despite any attempts from Fairmont Hall residents to protect it. If the Rock is looking extra colorful, it’s probably safe to say that these attacks aren’t just a myth. On Friday, new students attended interest meetings about the academic programs available to them on campus, and Saturday was spent registering for classes. Tuesday is the big day! Good luck to the new students, and, for returning Bulldogs—welcome back. Let’s make it a great year.